Seven months now. Sheikh Ibrahim Yaqoub al-Zakzaky has been unjustly imprisoned in a hellish dungeon by the US-Zionist-Saudi-controlled Nigerian regime of Muhammadhu Buhari for seven months now and the collective apathy from the Muslim world has only grown. A modern-day saint, Africa’s premier champion of the Palestinian cause, a pillar of Resistance, an Islamic scholar of the highest caliber and a revolutionary mind surpassed by very few, the Sheikh’s name should be on the lips of every Muslim in the world, yet the Ummah, on this matter, has ostensibly teleported to a distant planet and simply cannot be bothered. How is it that a moujahid of Zakzaky’s stature can be shot, tortured, throw into a cell on false charges, his wife shot and also locked up, three more of his sons murdered (the other three were assassinated on Quds Day 2014), his daughter attacked, his deputy slain, his home destroyed, the masjid where he teaches razed, and hundreds to thousands of his partisans and students slaughtered then dumped in a mass grave underneath the ruins of everything he built with his bare hands without the outcry of any “Muslim” organization on the planet? 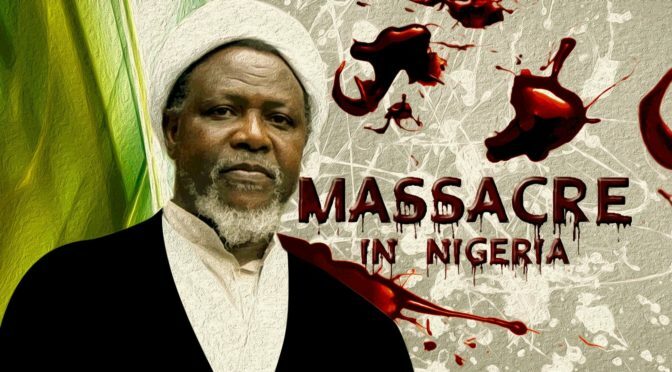 Outside of the Resistance Axis and the communities of the states and movements that comprise it, not to mention the beautiful people of occupied Kashmir, there isn’t a single “Muslim” state or mainstream “human rights” group claiming to speak for the Islamic Diaspora in the West that has come forward for Zakzaky and the innocent lives lost in the Zaria Massacre; nothing from CAIR and not a word from the OIC. Why? This isn’t a brain-tease; it’s not a strenuous task to figure out what the deal is but I will spell it out for you anyway. Because the piggish petrol pukes of the GCC who call themselves “kings” and “emirs”, the Saudi demons most especially, have paid everyone to be quiet. Take down Qadhafi and level Libya? Yell it loud says Al-Saud! Take down the Syrian Arab Republic led by Dr. Bashar al-Assad (or at least try to)? Scream it louder says Al-Saud! Spread the filthiest of filthy lies about Hizbullah and Iran? Do it big says Al-Saud! Recognize ‘Israel’, accept its criminal, genocidal presence in our midst and call it an ally? Zionism is super-halal says Al-Saud! Murder Yemeni babies in the name of “legitimacy” for a wholly illegitimate regime? Super-DUPER-halal says Al-Saud! But coming to the defense of an anti-Zionist, anti-Wahhabi, anti-Imperialist Nigerian leader whose followers were massacred in one of the most barbaric crimes you will ever come across? SHUT YOUR MOUTH AND SHUT IT HARD says Al-Saud!